Mr L. Mathews owned a Warrick similar to mine (his was registered AC 4419), found derelict in a field in 1950. He restored it and returned it triumphantly to the factory in early 1957. He subsequently wrote an article in the Veteran Car Club Gazette, from which I have gleaned much information for this website. I am indebted to his insightful observations and comments. When I met Greg Warrick at the Bristol Classic bike Show he told me that he’d recently been in touch with the Mathews family, and discovered that when the white Warrick ‘AC 4419’ was sold at auction, all the Warrick factory papaers owned by L. Mathews were sold with it. We decided to do more research to see if we could locate those documents. We found your Warrick website on the net and we are pleased that you made a website for the marque. 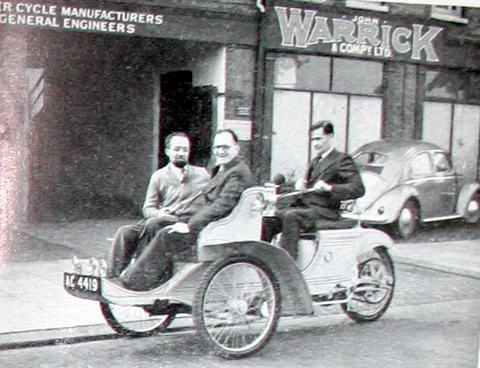 In the front seat there is Mr. L Mathews at the left and at the right is Mr. Warrick. The shown Warrick is the same as Mr L. Mathews found in the field in 1950. We purchased this Warrick at Bonhams Auctions at Beaulieu from the estate of Mr. L. Mathews. We did not know at the time we purchased it, there was a pallet full of documents related to the Warrick company. In fact it was the full Warrick factories written administration, accounting, archives, photographs and company records back to approx. 1879 !!! Including many personal written artefacts and photographs of the Warrick family including Mr Warricks passport…..
As we felt this archive should stay together, we passed it on to the National Fiets Museum Velorama ( National Bicycle Museum ) in Nijmegen, The Netherlands. We are longtime friends with Gert-Jan Moedt, the owner of the Museum and we felt they are the right people to take care of the conservation of this important piece of history. We thought we had to let you know, there is still some information available and conserved. Good to hear you are pleased to know of the whereabouts of the Warrick archives. I am sure Gertjan will cooperate publishing more literature. We think that photocopy everything you need will be the best. Give Gertjan a call or write him a letter, explaining the whole matter and mention us as a reference. We think you will find him a great guy, but as he is a very busy man, don`t expect he will do the further research for you.! The white Warrick resides in Spain, and is green now…. We told the owner about your website and he might send you some photographs. We should have photographs also somewhere, however they are before the digital time and are laying around somewhere…. Please keep us posted about the progress with Gertjan and if we can be of further help, please let us know !